During the second week, however, people started to attend, and by the final Sabbath (Saturday) of the program, 13 people had decided to be baptized. Among them were a pastor of another Christian faith and his wife. The evangelistic series not only brought them and their daughter into the Adventist family, but it also brought the couple back together after seven years of separation. Wala is an islet off the northeastern coast of Malakula and a community where most residents follow another Christian faith. Despite this fact, the local chief offered the Seventh-day Adventist Church a place to conduct evangelistic meetings in July 2018. Having welcomed everyone during the opening ceremony, the chief and his family stayed for the meeting. They returned home to find that their house had burned to the ground. Although very upset, the chief and his family continued to attend the meetings. On the final Sabbath of the program, five people, including the chief’s wife and son, gave their lives to Jesus in what was the first Adventist baptism ever held on Wala. Others, including the chief, wanted to be baptized but hesitated after receiving threats from the local community. 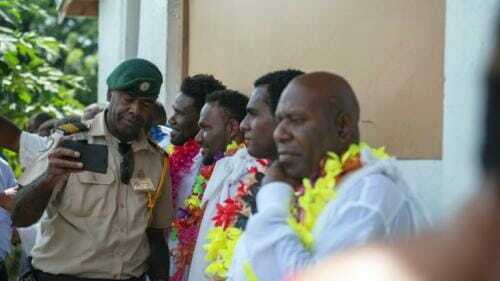 The Vanuatu Mission is now organizing Bible studies for these individuals. 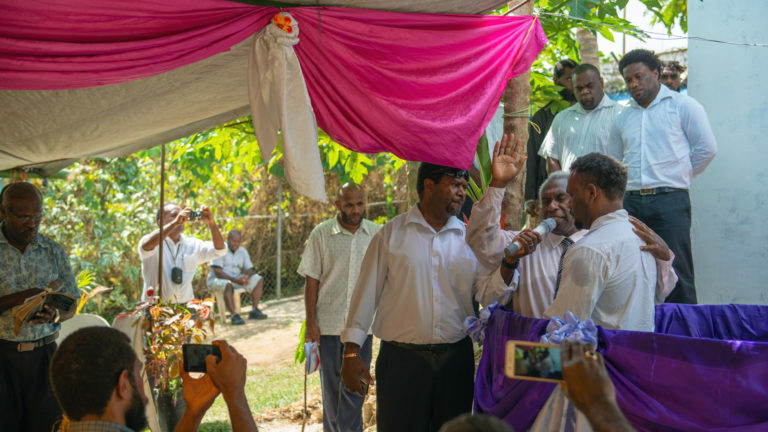 In a first for the Vanuatu Mission, a baptism was held at Port Vila’s minimum-security prison on July 28, 2018, with 12 inmates surrendering their lives to Christ. Baptisms were conducted by Nos Terry Mailalong, president of Vanuatu Mission, with Member of Parliament Ralph Regenvanu and other government dignitaries and police officers also attending the ceremony. Half of the prison’s inmates are continuing to study the Bible with the help of members from the nearby Epauto Seventh-day Adventist Church. Anyone who has moved to another country and not known anyone or how to speak the local language knows that it can be incredibly isolating. This was the case for Jung Wang, a Chinese woman who recently moved to Vanuatu with her family. Wang began to attend Sabbath programs and worship services at the Etas church. Then, at the end of July’s evangelistic series, she and her two daughters were baptized and became members of the Adventist Church family. Local church leaders reported that Wang’s husband, a local businessman, did not attend the meetings but supported his wife and daughters in their decision.